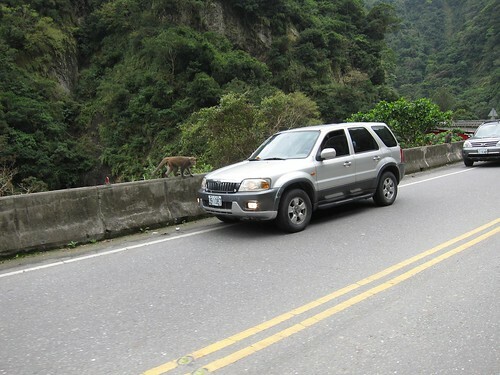 A monkey inspects a vehicle on the 23 near Donghe. China's top cross-strait negotiator, in Taiwan on a landmark visit, canceled three public appearances at the last minute Saturday after protests against his bridge-building trip turned violent. Zhang Zhijun, head of Beijing's Taiwan Affairs Office, is the first ministerial-level Chinese official to set foot on Taiwanese soil after both sides split 65 years ago. Mr. Zhang's office said his four-day trip, which started on Wednesday, is to "listen to the voice of the Taiwanese people at the grass root level" as both sides strive for further reconciliation. In a text message to reporters on Saturday morning, Taiwan's Mainland Affairs Office, responsible for coordinating the trip with its Chinese counterpart, said the changes were made in response to a spate of "conflicts" in recent days. On Friday evening, during his visit to the southern city of Kaohsiung, members of the pro-democracy Black Island Nation Youth Front threw white paint and bundles of paper ghost money at Mr. Zhang's vehicle as he was getting out of the car. Mr. Zhang wasn't hurt but several security agents were splashed with paint. Earlier that morning, also in Kaohsiung, a young male protester sustained a laceration to his forehead during a violent quarrel with a group of China supporters in front of the hotel where Mr. Zhang was staying. The Chinese envoy was also almost hit by a water bottle thrown by a Taiwan independence activist as he arrived at the city's high speed railway station. There were many other incidents, including protesters following Zhang everywhere he went holding signs saying there was one country on each side of the Strait. Kaoshiung Mayor Chen Chu mildly criticized the protesters, probably because Zhang had been slated to meet with her, an event that caused much speculation in the international media about China attempting to enhance relations with the DPP in case they win in 2016. The visit featured the usual ineptly staged official appearances, including a visit to Atayal country where the Atayal people were dressed up in quasi-Amis gear, and a visit to the Mazu temple in Lukang. The Mazu temple visit is quite interesting. The goddess Mazu has become an important symbol of annexation over the last few years (see this and this in-depth piece). The Lukang temple is the rival Mazu temple to the big Mazu temple in Dajia. In the rear of the Lukang Mazu temple is a small portrait of Shih Lang, the general who invaded and annexed Taiwan to the Qing Empire in 1683. One wonders if they wanted to incorporate that into the visit. My friend Drew tells me that even as the big Mazu temple in Dajia acts as an important nexus of religious fervor, pro-annexation politics, and cross-strait organized crime, many less important Mazu temples around Taiwan are cutting their ties to their parent temples in China (Taipei Times story on the allegations of police and gangster use of violence against protesters)(the Foreigner has some tart comments). Let's ask ourselves an honest question: Does violence really offer any viable solution here? As much as I admire the passion for democracy and independence by those young activists, throwing bottles and paint at a foreign government representative will not change things in your favor. And the excessive police force and disregard for accredited journalists casts another dark shadow on the current government, that barely anyone sees as capable to lead Taiwan. In light of these two factors, I'm rather pessimistic about what Taiwan really got out of this meeting, but one thing is sure - the discourse in Taiwan has not moved beyond the usual blue-green rhetoric. While protests were expected and necessary, the violence was counterproductive. You can't talk with someone who is shouting, or throwing things at you. If one day we have a green government, and a representative is sent to China for talks, how would Taiwanese feel, if Chinese protesters physically threatened that representative? The protests were never about talking to Zhang. They were there to subvert and destroy the media narrative that Zhang was trying to create. In that they were successful. Dialogue between China and Taiwan opened in 2008 after Beijing set aside its military threat to sign economic agreements with Taipei and Taiwan President Ma Ying-jeou agreed to put off political issues to build trust and improve the island's economy. ...as if the DPP never negotiated with China and when did Beijing set aside its military threat!? Thanks, international media. As long as you guys write like that, we bloggers will always have readers. Taiwan Explorer ends by asking how Taiwanese would feel if Chinese physically threatened a pro-Taiwan representative sent to China for talks. That's easy to answer. They wouldn't like it. We know that because pro-Taiwan types are rather regularly threatened when they advance pro-Taiwan views in overseas venues. We know that because, well, all of China policy toward Taiwan is essentially a violent threat to murder and maim Taiwanese in order to annex their island; that threat is indeed the only reason anyone bothered to pay attention to Zhang. Bottom line: if Zhang's nation didn't threaten to toss missiles at Taiwan, its representatives wouldn't be met with thrown bottles and paint. "members of the pro-democracy Black Island Nation Youth Front threw white paint and bundles of paper ghost money at Mr. Zhang's vehicle as he was getting out of the car. Mr. Zhang wasn't hurt but several security agents were splashed with paint. Earlier that morning, also in Kaohsiung, a young male protester sustained a laceration to his forehead during a violent quarrel with a group of China supporters in front of the hotel where Mr. Zhang was staying. The Chinese envoy was also almost hit by a water bottle thrown by a Taiwan independence activist as he arrived at the city's high speed railway station." Did you notice how we hear clearly who threw things at the envoy, but the injuries to protesters are in passive voice? This comes up again and again in international media. Radicals and troublemakers on the pro-Taiwan and 'something happened' to protesters, no idea who did it. The beautiful Tea Masters on how to make great iced tea. Kitteh is unhappy with Zhang. I've been busy putting together a presentation so enjoy Taiwan Voice's reporting on the visit of Zhang Zhi-jun's visit to Taiwan. Click on Read More to see full report.... (Facebook). Fourth and last day of Zhang Zhijun’s visit—Zhang cancels scheduled visits; Taiwan’s MAC still treated as nothing more than Zhang’s personal secretary. An east coast river gorge. It's certainly a PR thing. But it's not aimed at the people of Taiwan, few of whom want to be part of China or believe that the PRC has any of the important interests in mind. China knows that. Rather, it is aimed at the domestic audience in China, to let them see how kind and generous the PRC is to Taiwan, what care it takes to do the right thing. So that the PRC can say to its people when it attacks Taiwan "look, we tried everything, but they wouldn't listen to reason..."
In large measure, the visit to Taiwan by Taiwan Affairs Office Minister Zhang Zhijun (張志軍) has already been a success — at least for the Ma Ying-jeou (馬英九) administration. Both sides have agreed, over renewed public opposition, to quicken the pace of economic integration. More measures for Chinese tourists have been planned. And the government has again signaled that Taiwan’s economic fate relies, in fact, on China’s goodwill. The message was driven home by the request for China to agree to Taiwan’s eventual membership in the Regional Comprehensive Economic Partnership (RCEP) and the Trans-Pacific Partnership (TPP). In a statement on Wednesday, Mainland Affairs Council Minister Wang Yu-chi (王郁琦) told his Chinese counterpart that inclusion in the regional trading regimes was a matter of “survival” for Taiwan’s economy. Chao goes on to note that the US has made it clear that China's approval is not an issue for Taiwan's participation in the TPP. So why is the Ma Administration courting it? Just another service of Ma to Beijing, and just another way to keep irritating Washington to give the impression that Taiwan is a poor partner and should be abandoned. Washington backs Ma to its own detriment. Peter Lee on Hillary and China. Lee would probably be more perceptive if he didn't engage so relentlessly in reductio ad Cold War. WantChinaTimes sometimes has good articles on Taiwan. This one on the island's entrepreneurs trying to get their children into the family business is one of several with this theme they have run. CPI blog on the China map changes. Ben Goren too. The demotion of the judge in the Wang Jin-pyng case is discussed in detailed piece in Taipei Times. The pattern of administrative punishment of judges who rule the "wrong" way is all too familiar, and also extends to other members of the judicial system. The issues of ecological preservation and sewage treatment surrounding the development of Hsinchi Industrial Park (新吉工業區) in Tainan brought about opposition by environmental and local cultural groups. 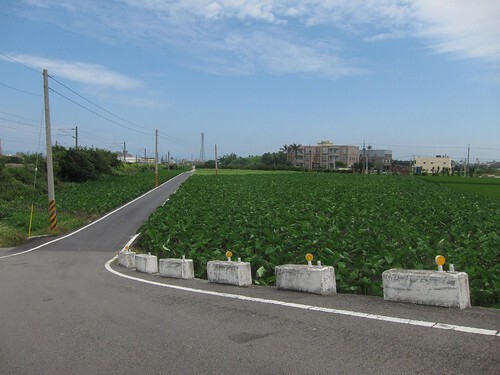 In March, Tainan City government withdrew the initial plan and proposed amendments that, in addition to zero wastewater discharge, another hectare was to be set aside as a pheasant conservation area, saving 4.2 ha of land in total, which is about the size of five football fields. 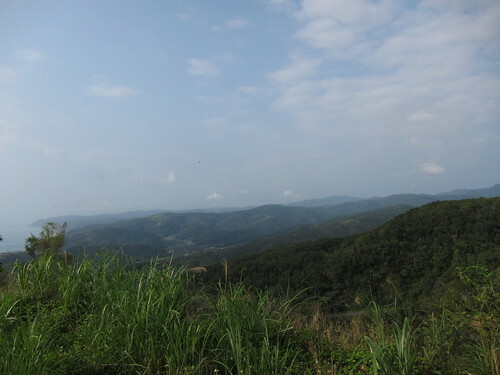 Hsinchi Farm, the designated area for Hsinchi Industrial Park, measures more than 120 ha (about the size of 145 football fields) and is currently a sugar cane field inhabited by wild birds such as oriental pratincoles and common pheasants. 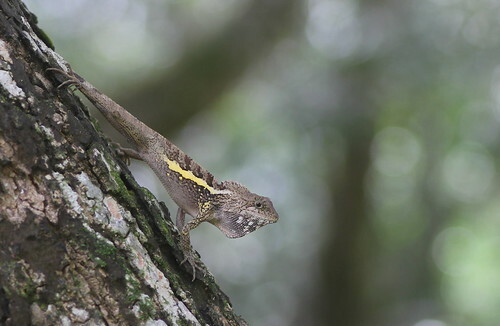 The government initially planned to discharge wastewater into the wetlands in Taijiang National Park, but was lambasted by environmental groups and local inhabitants. 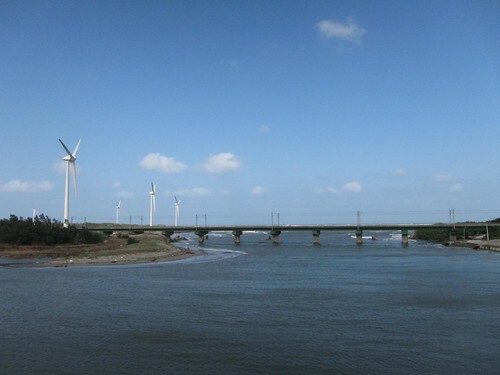 Fang Chin-cheng (方進呈), the chief of the Tainan City Economic Development Bureau, said that the amendments approved last month were being sent to the Environmental Protection Administration for an environmental impact differential analysis review. Prior to the review, he said they would schedule a seminar to explain everything to the locals. 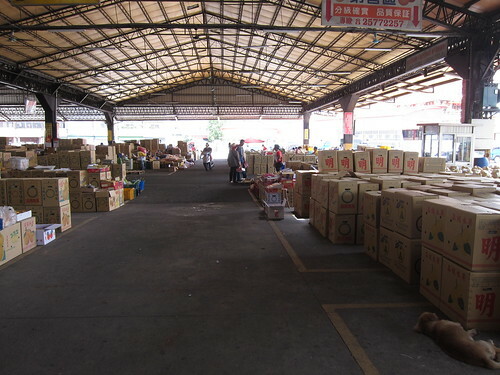 The pear market in Dongshih. Taiwan's political commentators were working overtime today with the dramatic announcement by current New Taipei City Mayor Eric Chu (Chu Li-luan) that he will run for re-election in the Nov 2014 local elections. 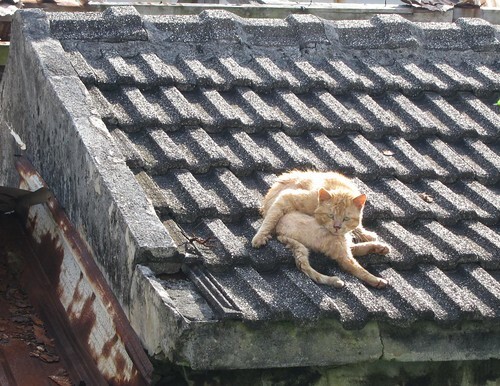 He has promised that if elected he would not step down to run in 2016 for President. There had been much speculation that Chu would run in 2016 and many us considered him the KMT's best choice for Presidential candidate. Why would Chu decide to remain in New Taipei City? He's only 53, so he has a decade in front of him. The year-end elections are starting to look dicier for the KMT and having the KMT firmly in control of the nation's biggest municipality would help them in 2016. There may be some internal KMT pressure as well -- Chu is a mainlander but is not in President/Chairman Ma's circle. I suspect if this is Ma's doing, then we'll see Ma advance the current premier, Jiang Yi-hwa. It may all be vapor -- Chu will run, win, and then step down to run in 2016. As my friend Ben pointed out, he could well lose, and then he'd be free for 2016 anyway. 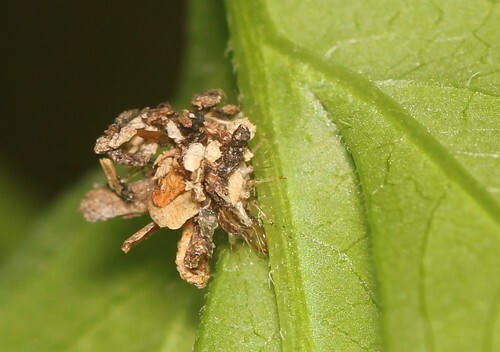 A bee captured by a spider attracts tiny flies to feast on its corpse. Taiwan in Cycles over the hills of Nantou. Great ride. Beijing should make its stated intention of seeking a peaceful path to unification credible by putting some limits on its military modernization and stopping military exercises focused on intimidating Taiwan through missile barrages or blockades, they added. What a lame piece of analysis which incorporates a pair of ugly American analytical habits. First, they demand that the US put a crimp in arms sales. In exchange -- no, I kid you not -- they ask Beijing to stop military exercises that might intimidate Taiwan and stop some arms buildup. This is the classic US vs China negotiating stance, in which the US gives up some permanent interest in exchange for limited and temporary gains. No point in even commenting on how silly it is to ask Beijing to give up exercises in exchange for not selling weapons. Exercises might even be useful -- they remind the Taiwanese that things are not well. Useful, since other US experts want Taiwan to spend more on defense. Reducing exercises might well lead everyone to the false conclusion that things are better than they actually are... creating complacency among the Taiwan (and US) public. The writers also identify two sets of tension. The first is Beijing's desire to annex Taiwan which causes Beijing to threaten it, leading to tension. The other is US arms sales to Taiwan, which causes tension. In both cases the tension is caused by Beijing's desire to annex Taiwan. Beijing objects to arms because they complicate its desire to annex Taiwan. Arms sales do not "cause" tensions -- to make that claim is to deny that Beijing has agency, as if Beijing were a coin bank that makes a noise every time you toss a quarter into it. Beijing chooses to ratchet up "tensions". Beijing employs "tension" against arms sales as a way to shape the way policymakers think about the relationship with China -- "tension" is a policy, not a visceral reaction. A very successful one, in this case. The correct response to such artificial tensions is to ignore them, politely. And definitely, not to incorporate them into your own analyses. That just legitimates the "tension" tactic of Beijing and encourages it to deploy "tensions" more often. Argh. Way to go, O'Hanlon and Steinberg. Beijing attacking democracy sites in Hong Kong -- and Apple media in Taiwan with denial of service assaults? Ben G is interviewed by Ketagalen Media. Well done! MKL with a great post on scooter ownership and other driving stats. The fight over bail for the Keelung city council speaker continues. All sorts of corruption, but who is actually being punished? The 53-year-old's guilty verdict was upheld by the Supreme Court on May 22 for soliciting a bribe of NT$1 million (US$33,000) from local businessmen in 2007 when the county organized street fairs for the Taiwan Lantern Festival that year. In the final verdict on the case, the court gave a sentence of 10 years and four months with a suspension of civil rights for five years. His jail term was set to begin June 6, but Yu did not show up. What? A criminal convicted of corruption skipped out on his prison sentence? Who could have predicted that? It's not like it hasn't happened ten thousand times before. Where is Lo Fu-chu? Where is Wang Yu-yun? The list of such individuals is long, and the gov't has been stalling about a law for this for years. So disgusting sarcasm just fails. It's not only the politicians but the System itself that is corrupt. Huang was planning a bid to become Keelung mayor in the year-end elections and the domino effect from his arrest will influence all other KMT-ruled cities and counties, prompting voters to cast their vote for other parties, which will will likely see the opposition Democratic Progressive Party (DPP) become the biggest winner in the seven-in-one elections. President Ma's focus on the image of the KMT as "incorruptible," may very well be his party's downfall, as it has been used to back corrupt Keelung mayors, such as former mayor Hsu Tsai-li and incumbent Chang Tong-rong. Nearly all of Ma's closest KMT allies and subordinates have been indicted, arrested or convicted for corruption, including Miaoli county magistrate Liu Cheng-hong, Nantou county magistrate Lee Chao-ching, Changhua county magistrate Cho Po-yuan as well as Chang, which has undermined the president's image. Far more important will be the infighting at higher levels of the KMT and the incompetent, arrogant, indifferent performance of the President, who is also the KMT party Chairman. If Ma makes another strafing run at Speaker of the Legislature Wang Jin-pyng, who was the subject of a bruising political battle last year (search MaWangMess), that will do far more damage to the Party than corruption investigations. According to critics, the KMT has apparently moved to make sure the judges rule the way the KMT wants them to, which implies that Ma is going to go several more rounds with Wang. Let's hope he decides to move before the November local elections. But the real corruption? Is it in the second police assault on the Executive Yuan protesters? The first merely involved fists. This second one involves using the law as a club.... Taiwan Voice posted this on Facebook. Click on Read More to see the whole sad story. On the road in Miaoli. Dr. Samuel Yin established the Tang Prize in December 2012 to encourage individuals across the globe to chart the middle path to achieving sustainable development by recognizing and supporting scholars for conducting revolutionary research in the four major fields of Sustainable Development, Biopharmaceutical Science, Sinology, and the Rule of Law. The Tang Prize is truly global in reach, with laureates selected on the basis of the originality of their research along with their contributions to society irrespective of their nationality or ethnicity. Dr. Samuel Yin, founder of the Tang Prize, is currently chairman of the Ruentex Group and chief development officer, chief technology officer, and chief engineer of Ruentex Construction & Development. He is also an adjunct professor in the department of civil engineering at National Taiwan University and a professor at Peking University, where he advises PhD students. Dr. Yin read history at Chinese Culture University. He received a master's degree in business administration at National Taiwan University and a doctorate in business administration at National Chengchi University. Yin runs a number of charity programs in China to "bring the two sides closer together" (article). It's not difficult to see where he stands ideologically. Note the categories. The award in Sinology and the award in Rule of Law represent two KMT critiques of the CCP -- respectively, that the KMT is the true repository of Chinese culture, and the KMT government follows rule of law, unlike the CCP. The first Sinology prize goes to intellectual and scholar Yu Ying-shih, who -- predictably -- was a major scholar of Confucian thought -- you know the KMT is all about Confucianism -- who helped reconcile Confucianism and democracy. He's a critic of the CCP. What a coincidence, a major Confucianist who is a critic of the CCP gets the first prize. It's not difficult to see what the Tang Prize is about, ideologically. It looks like a mishmash of KMT ideologies in prize form. Did I mention it was named after the Tang Dynasty? You'd think that Sustainable development... no need to complete the thought. The winner is Gro Harlem Brundlant. She was Prime Minister of Norway. What's the country that China is still peeved at since they awarded a Nobel to Liu Xiabo? It's probably just a coincidence that it looks like a sly twit of China. Can't wait to see who they award the Rule of Law prize to tomorrow. UPDATE: Albie Sachs of South Africa won the Rule of law award. Maybe this might morph into something more than just the KMT vs CCP struggle over who is more "Chinese" and what "Chinese" is. That would be good. 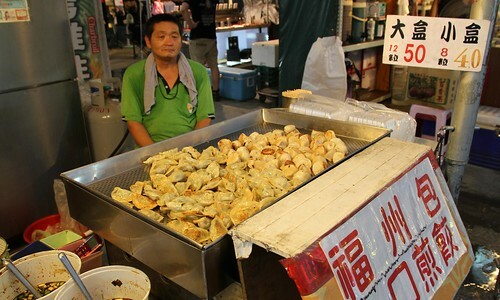 Globalization in Taiwan's night markets. Keelung Speaker released on bail: another KMT-run local government seeing politicians fall for corruption. Don't worry, the Party will get re-elected in all these places. 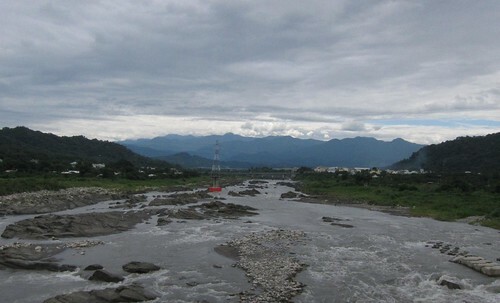 The central mountain range from the river far below. Controversy erupted when some posters advertising the exhibition were found to refer to the NPM as simply "Palace Museum, Taipei" an apparent violation of the agreement between Taiwan and Japan that the museum's full name must be used in all publicity materials. According to the Presidential Office, President Ma Ying-jeou has instructed the NPM to demand the Tokyo museum correct the situation, and the government's stance has been conveyed to Tokyo by the Ministry of Foreign Affairs. "The posters in question, which have been spotted at train stations and parks in Tokyo, were prepared by a media sponsor group comprising major media outlets including NHK, the Asahi Shimbun and other TV stations and newspapers. Meanwhile, official posters and brochures prepared by the Tokyo National Museum refer to the Taipei museum by its official name." - so why is the Ma govt complaining to Tokyo and not the media group in question? like you said, easy to pick a fight with a friend than stand up to a bully. The Fair Work Ombudsman is preparing to launch an investigation into claims backpackers employed as fruit pickers in one of the country's biggest food producing regions are being underpaid by labour hire contractors and forced to live in illegal budget accommodation. The investigation will focus on the Queensland city of Bundaberg where, each year, thousands of travellers spend at least 88 days working on farms along the harvest trail in order to extend their 417 working holiday visas. Taiwanese backpacker Claire, who goes by her Australian nickname, moved to the city last June to work on a tomato farm. Speaking to 7.30, Claire claimed to have been significantly underpaid, forced to sleep in a living room with 25 other backpackers, mostly from Korea, and denied rest breaks despite working all day beneath the sun without shelter. "We just got $7 a day and we needed to spend maybe six hours a day picking tomatoes," she said. The wage was paid in cash by a labour hire contractor who then charged Claire $125 rent each week to sleep on a mattress on the floor. What horrible people these company owners are. @Formosanation passed this around on Twitter today. 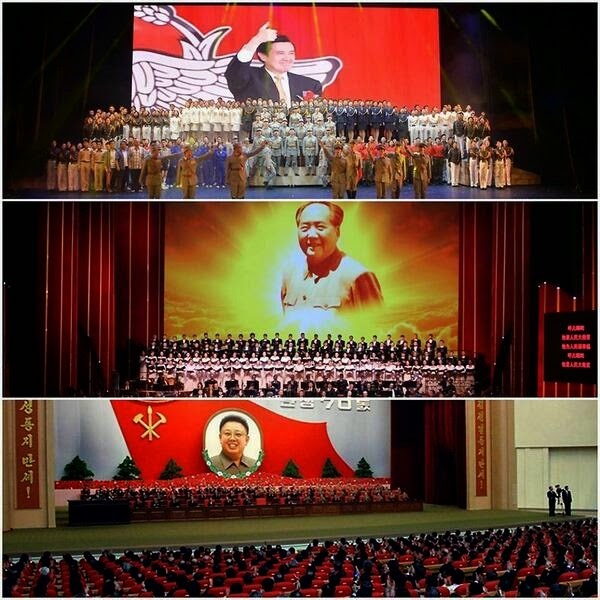 That's President Ma Ying-jeou in the vibrant red and black in the first panel. 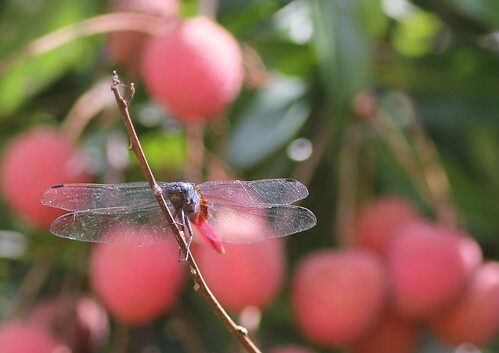 A dragon among the lychees. 1. China Post goes all in for independence. Not kidding, the second page of this is mind-blowing coming from the Taiwan-denyin' KMT-lovin' China Post. 2. Commonwealth on the vast wealth gap that is choking the life out of Taiwan. Another superb effort. 3. Banks exposure to China at record high. China has the local financial industry exactly where it wants it. As part of the reciprocal commitment, Ko agreed to hold talks with DPP candidates in other mayoral and commissioner elections to formulate “shared platforms” and, if he wins the election, take the same positions as DPP mayors and commissioners on major policy discussions. Ko also pledged to campaign for DPP candidates in the Taipei councilor elections. On Twitter @Formosanation sent around this SETTV poll. 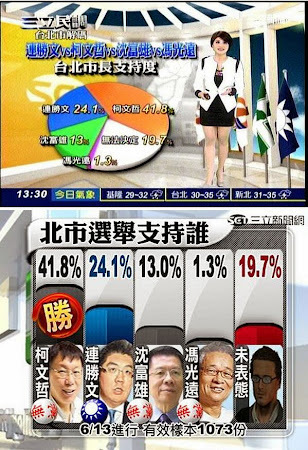 The poll has Ko Wen-je, the independent candidate supported by the DPP, in a comfortable lead over Sean Lien, the KMT princeling. Interestingly, former DPPer Shen Fu-hsiung entered the race the other day and polls at 13%. @Formosanation pointed out that his father, a die-hard KMTer, had switched from Lien to Shen and mentioned that many others appeared to be doing the same -- Shen is not taking votes from the pan-Greens, but from Sean Lien, yet more evidence of how widely detested the candidate of the 1% is in his own party. But with the KMT voters split, conditions are slowly emerging for a major upset -- if Ko's handlers can keep things under control. Even more impressive is that 19% for the rightmost candidate in the graphic, the DPP's Pasuya Yao. If you add that to the 41% that Ko has collected, you get an overwhelming pan-Green victory. Argh!! I don't believe that will hold up, and polls like this are incredibly unreliable -- voters might utter protests to pollsters, but on election day they come home to the Party. But it makes a nice little fantasy. 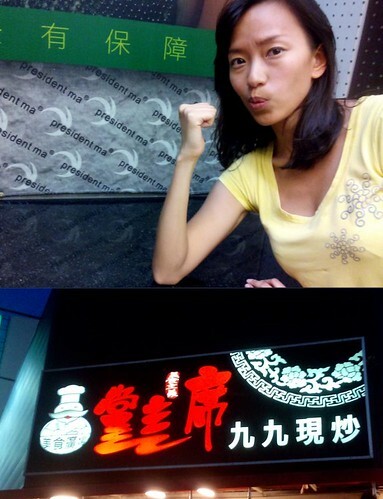 Restaurant in Taichung named "Chairman of the Party" in Chinese. Its English name? President Ma. Robert Kelly and Chong Wah Chow have turned in another gem with the latest edition of the Lonely Planet Guide to Taiwan (Amazon). Kelly, a net-acquaintance who sent a copy to me for review, is one of the three or four most knowledgeable people about things Taiwan. I often consult him when I am going somewhere on the island. So it was with great anticipation that I cracked open this latest version of the Guide. County Road 199 This idyllic country road rewards at every turn with a rich history and varying landscape of hills, ponds, farms, aboriginal villages, and open fields. It's a preferred route for those continuing at a leisurely pace on to the East Coast (Hwy 9 is faster but thick with speeding buses and trucks), or vice versa. 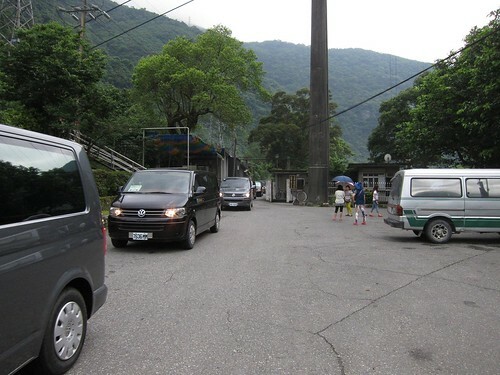 The historical site of note is the Tomb of the Ryukyuan Sailors just off county road 199 near the kilometer 36 mark (look for the Japanese style stone lantern on the road side). It's a collective tomb to 54 sailors from Ryukyu (today's Okinawa), murdered by Paiwan aborigines in 1871. 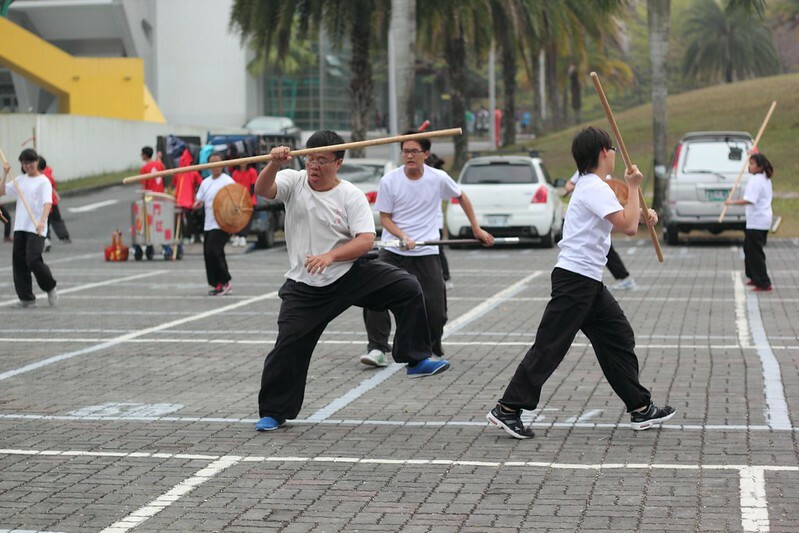 The incident subsequently ignited the battle between the Japanese and the Paiwan in Shihmen in 1874. Note that the first three characters on the stele literally saying "Greater Japan" have been blotted out. Heading east, Sichongsi (Szchongsi) Hot Springs is a real treat, and a soak in an outdoor pool in the cooler evenings is especially recommended. This description goes on for a few more paragraphs, replete with local and historical knowledge, a pleasure to read even if you've never visited (pics of 199 here). Travelers familiar with Lonely Planet's guides will recognize the basic format of this one. 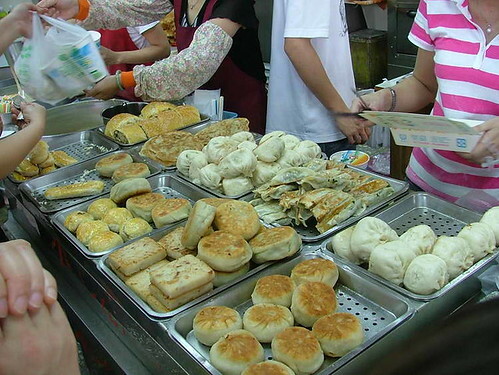 In general, the Taiwan guide provides useful and comprehensive information for travelers (this means that our Taichung is almost ignored, and deservedly so). In smaller towns it will guide you to really cheap places to stay, but in larger ones it generally focuses on mid-range or above hotels. 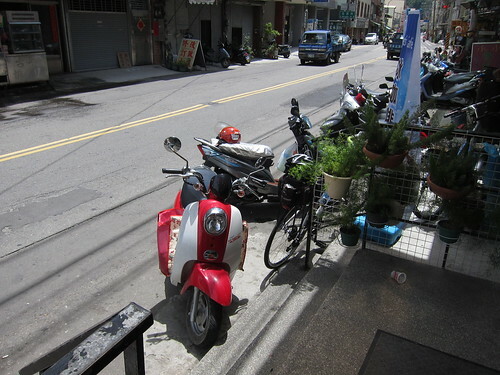 There's no point in listing all the hotels and hostels in Hualien, for example, they appear and disappear like bacteria on a bathroom wall, nor is it possible to list them. The maps are excellent and the blue-gray color scheme of this book very pleasing. The book also presents ideas that might not occur even to us old-timers, like "Temple Touring on the Southwest Coast". 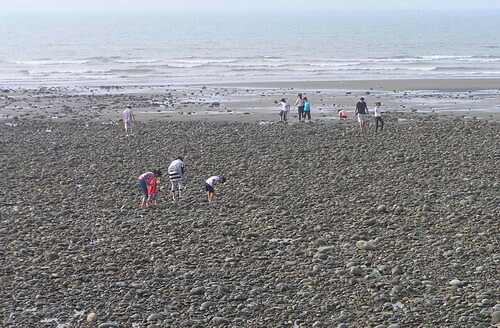 It even includes places where few travelers go, like Ershui in Changhua. 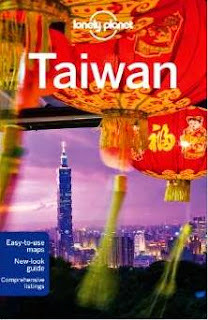 The book also contains an extensive and detailed section on Taipei. Don't miss the Walking Tour guide! It is in there to show that there is more to Taipei than a few tourist spots the government promotes, and also how the shoddy, giant faux Ming architectural disaster known as the Chiang Kai-shek memorial hall and other stuff actually cut arrogantly through the richly developed local neighborhoods. 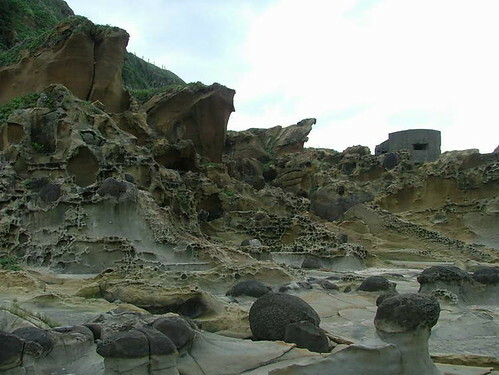 There's hidden depths to Taipei that the guide really brings out. All in all, an extremely useful "to do" guide that both travelers new to Taiwan and those with long experience can benefit from. Kudos to Kelly et al and Lonely Planet for turning out an excellent guide to The Beautiful Island. Highly recommended. Goodies at a small shop near Jiufen. It's a wondrous transmutation, where the blood of one man is turned into the money of another. Lead into gold is nothing to it. On June 3, Changhua, Yunlin and Chiayi counties and Greater Tainan were hit by a series of thunderstorms. Most streets in Chiayi City are supplied by the high-lying Lantan Reservoir (蘭潭水庫) on the east side of the city toward lower areas on the west side. 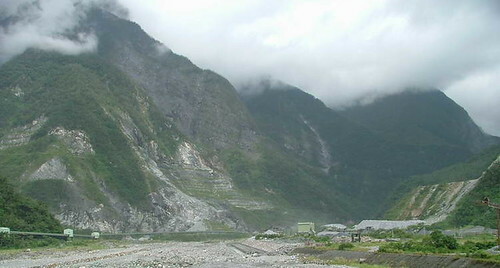 Given that Chiayi is built on hilly land about 100m above sea level and considering its geological composition of red soil and gravel beds, it is not an area in which floods should easily occur. The main cause of the floods is connected to the rising property prices over the past decade. Before development, most of the land was hilly terrain that effectively drained and held back floods. The hinterland around Chiayi Park and the Chiayi Botanical Garden performed a similar function. However, almost all of these hills have been developed into luxury homes and non-agricultural village estates for the rich. These commercial developments are paved with impermeable surfaces. Consequently, even Chiayi University’s Lantan campus is awash with mud. 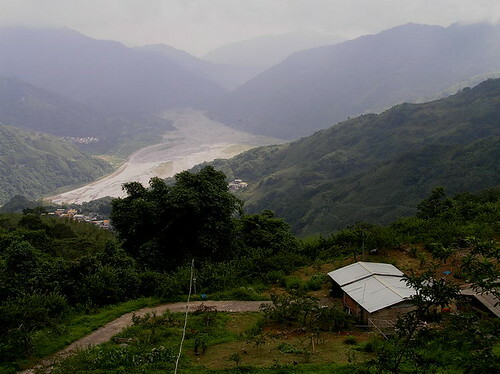 When rain fell on Fenci Lake (奮起湖) and the upper reaches of the Bajhang River (八掌溪) 20 years ago, it took about eight hours to reach the south side of Chiayi City 40km away. Now it takes little more than two hours to arrive. The housing bubble is driving ever expanding development of hills and mountains near cities, a process that began in the 1990s after the first housing bubble. The author notes that the flooding is also linked to the greater power of storms and rising seas driven by humans heating the earth, an outcome of developmentalist mentalities everywhere. 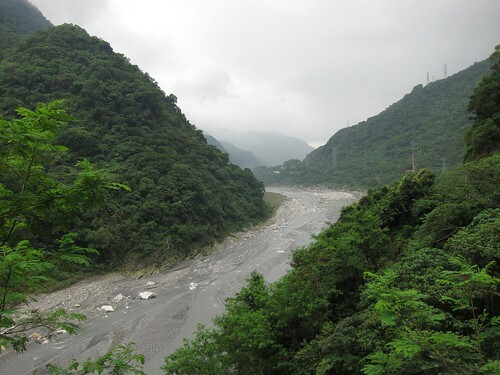 The rapidity with water from the hills now reaches the sea, thanks to construction-industrial state concreting of so many of Taiwan's rivers, was a major cause of the massive flooding in southern Pingtung after Morakot. However, not long ago, the Ministry of Justice released data comparing housing prices and incomes. The comparison allows observers to estimate how affordable housing is. The ministry’s data ranked Taipei and New Taipei City first and third in the world, with housing price to annual income ratios of 15.01 and 12.67 respectively. The loan burden was 63 percent and 53 percent respectively, resulting from the government allowing the commercialization of housing. The public housing that the administration promoted in the past was built at below-market costs, but it was common knowledge that once the properties were sold on to future buyers, their prices would be more equivalent to the going market rate. The affordable housing policy that the government started pushing in 2010 might sound novel and original in name, but it is not very different from the old public housing policy. It aims to cheaply sell land to developers who stand to make a profit on construction work. The writer observes that this development proceeds apace, despite the fact that the cities are filled with empty homes. This is not difficult to explain: subsidies for construction and land development make it so lucrative that a developer need merely fill half the homes in a large project to break even. The policy the government has selected to bring down housing prices is to build more housing. Who benefits? People who build homes and develop land, of course. There are many policies the government might choose, such as subsidizing rents, direct subsidies to workers to pay for housing, or buying empty residences and renting them. But none of these policies benefits the construction-industrial state that runs Taiwan because they do not result in new land being "developed" or new buildings being thrown up. Bidding for the government’s affordable housing project is finished and “lottery-style” public housing will be built next to the A7 station on the future airport MRT line. However, the Housing Act (住宅法) passed late last year does not define “social housing.” It states only that 10 percent of new social housing must be reserved for disadvantaged groups. The government shirks all responsibility for the project, which will be a BOT project favoring construction companies. Housing prices will be announced on a district-by-district basis so pricing is neither transparent nor based on real market prices. That writer also noted that other countries in the region social housing provision exceeds Taiwan's. The reason the corruption case involving former Taoyuan County deputy commissioner Yeh Shih-wen (葉世文) has caused such alarm is that Yeh was also for a long period in charge of the Construction and Planning Administration. In this position, he passed countless urban planning and renewal projects, as well as land zoning changes for non-urban areas, many of which would have involved forced land expropriation. Past land expropriation appeals have been mere formalities, mostly for show, so if the Urban Planning Commission has passed a motion, the subsequent land expropriation is practically guaranteed. A case in point is the verdict handed down by the Greater Taichung High Administrative Court on the Dapu Borough (大埔) demolitions in Miaoli County, the appeals for which were cursory at best, taking on average little more than five minutes each to go through. It has been many years since martial law was lifted, yet the government has not changed in terms of its excessive use of land expropriation. If anything, things have become worse in the past few years. For example, in the period up until late December 2012, the government completed the expropriation of 95 zones, involving about 7,672 hectares. The mere formality aspect of appeals processes is common whenever the big money touches on an aspect of Taiwan life, from land development to ECFA and the services pact, whose KMT-led "review" was originally declared over before it had begun. One reason that Ma Ying-jeou was able to get elected is that almost alone among the politicians of his generation he was able to clench his teeth for a short period before each election and spit out the words "I am Taiwanese." This was purely an election tactic, dispensed with as soon as he was safely in office. So it was with great interest that I watched three leading contenders for the KMT's presidential candidacy this week aver that the citizens of Taiwan (ROC) could decide their own fate (Taipei Times), along with Ma Ying-jeou hisownself. Several days ago, Mayor of Tainan and DPP party member William Lai said in an interview that “the future of Taiwan shall be collectively decided by the island’s 23 million citizens.” During a routine press conference of the PRC’s Taiwan Affairs Office of the State Council this morning, spokesperson Fan Liqing responded: “Any issue touching upon Chinese sovereignty and territorial integrity must by collectively decided by all Chinese people including our Taiwan compatriots.” Fan also reiterated China’s firm stance against Taiwanese independence. William Lai is looking mighty presidential with comments like this, but he needs a period of service in the north or at a higher level so he can increase his name recognition. Meanwhile, the CCP's claim that all "Chinese" should decide Taiwan's fate was the object of much merriment on the internets, since Chinese cannot even decide their own government. Note that spokesperson gave the typical my-way-or-the-highway version of Beijing's demands: we think everyone in China should decide Taiwan's fate, so long as they don't decide to make it independent. This is simply the PRC version of Ma Ying-jeou's ROC version that the 23 million people of Taiwan should determine the island's fate so long as there is no independence. That is why, in the WantWant piece above, Ma's "no independence" position was immediately reiterated after he made the comment about who determines Taiwan's fate. The future of Taiwan is a decision to be made by its 23 million people, three Chinese Nationalist Party (KMT) mayors said yesterday in response to controversial comments made by a China’s Taiwan Affairs Office (TAO) spokesperson. Taipei City Mayor Hua Lung-bin (郝龍斌), New Taipei City Mayor Eric Chu (朱立倫) and Greater Taichung Mayor Jason Hu (胡志強) were welcoming a planned visit to Taiwan by China’s Taiwan Affairs Office Director Zhang Zhijun (張志軍). During his visit to China, Lai was neither haughty nor humble. When he talked about Taiwan independence, it was because a Chinese academic had raised the subject. Lai showed a lot more guts than Mainland Affairs Council Minister Wang Yu-chi (王郁琦) did when Wang visited Nanjing University. Nonetheless, Lai is a moderate in the DPP — about as moderate as you can get without being pro-unification. Meanwhile, former vice president Lien Chan (連戰) and his family have followed a path of allying themselves with the Chinese Communist Party (CCP) to combat Taiwan independence. The reward they seek is to add even more to the Lien family’s already vast economic interests. Now the KMT has put forward Lien’s son, Sean Lien (連勝文), as its candidate for mayor of Taipei — in an attempt to use the “new generation” to cover up its true nature as a party-state vested interest group. The Lai Affair shows how out of touch Sean Lien really is. Another nifty facet of Lai's words is that they put the onus on China for straining relations, as one commentator argued. Meant to shore up Ma's pro-annexation policies, they actually compelled him to reiterate support for Taiwanese to decide their own future, which must have been deeply distasteful to him, and reminded Taiwanese of Beijing's hateful expansionist policies. Slavery in Thai prawn industry. Ben with great piece at CPI on KMT, Ma and Broken Promises. Taipei Mayor race: DPP backs independent Ko Wen-je. Not much to say about that. Crossing fingers that when the pressure gets tight in the weeks leading up to the election, Ko has learned to keep lips buttoned and smile a lot. King Pu-tsun, Ma's "little dagger", argues that troops should be used against protesters. The security apparatus laughs. William Murray argues Taiwan needs small patrol boat fleet, while J Michael contends Taiwan ought to demilitarize Taiping Island and declare it neutral. Like that would keep Beijing out. Q: How do you know the person standing in front of you is Chinese? A medical researcher at X University mentioned it's getting harder for Taiwanese to participate in international conferences. The pharmaceutical companies used to pay for Taiwanese scholars to attend, but now they pay mostly for mainland Chinese. At the last conference she attended, her nationality was listed as "Taiwan, Province of China" and this was even on her name tag! In the past, asking conference organizers to correct it might get a positive response. These days the organizers get angry! I suggested she get the message across in a more personal way, by talking to people face-to-face: When meeting someone at the conference, shake their hand, and point to your name tag, smiling brightly, and say, "I'm (name)--and by the way, Taiwan is NOT part of China!" Laugh a bit, then immediately return to a conference-related topic. China can bully you internationally, but no one can stop you from speaking your mind...at least, not here. When you chat with mainland tourists, if you don't say anything about it, they really do go home thinking you're okay with Taiwan as part of China, just like one big family! Instead, would you dare to say, "We like people from mainland China, but we don't want to have the same government," and then tell them why? Because Taiwanese are so quiet, so humble, and prefer to avoid conflict, most mainland Chinese actually have NO IDEA that Taiwanese people might not be happy to be part of China. I'm told it can be quite a shock when they find out. Isn't it possible to remain gentle without becoming...invisible? J Michael spent some time on China's first ever White Paper on Hong Kong. China on June 10 issued its first-ever white paper on “one country, two systems” and the current state of things in Hong Kong, the former British colony that was re-unified with the Mainland in 1997. While the document contains little that is unexpected in terms of rhetoric that expounds the virtues of the system or calls for patriotism, the timing of its release — this summer promises to be eventful as activists prepare for a series of sit-ins, “unofficial” referenda and other escalatory measures in defiance of Beijing and its allies in the territory — is very telling. The unintended message of the white paper is that Beijing is worried, and that further restrictions are to be expected. There are a few lessons and warnings in there for Taiwan. As my friend Tommy Patterson remarked on Facebook, it is not as though we didn't know that One Country Two Systems is a facade. Democracy in Hong Kong threatens Party control over China, while democracy in Taiwan keeps it free. Hence the paper says that Taiwan would be able to maintain its capitalist system -- note, not its democracy -- over a long time, which, as J Michael observes, is not indefinitely. Hence the several warnings in the white paper, such as: “The high degree of autonomy of HKSAR is not an inherent power, but one that comes solely from the authorization by the central leadership. The high degree of autonomy of the HKSAR is not full autonomy, nor a decentralized power.” [italics added by JMC.] We are told who is boss, and reminded that autonomy could be denied should things degenerate in the territory. More ominous is a passage in the section “Fully and Accurately Understanding the Meaning of ‘One Country, Two Systems,’” which emphasizes that China is, in the end, a “single-system nation” (中華人民共和國是單一制國家). The mask is off: one country lies supreme, and there is absolutely no reason to believe that Beijing is even willing to countenance a more permissive model when it comes to Taiwan, as was made perfectly clear late last month when the Taiwan Affairs Office shot down a “greater one China” proposal initiated on Taiwan’s side to help resolve the impasse in the Taiwan Strait. The resulting political system will depend on the "goodwill" of Beijing. Which has none. Beijing's treatment of Tibet (tearing up the 17 point agreement) and Hong Kong (delaying or not implementing agreements) shows that idea of "a good deal" is a delusion. In neither example has Beijing kept its promises. There is no good deal to be had from Beijing, it's Beijing's way or war. 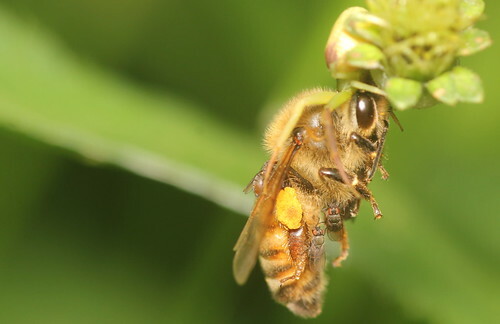 Tea party congressmen block important study of warming climate on Chinese tea production. NOT TAIWAN: Did Vermeer use photographic techniques to paint his incredible paintings? According to the latest opinion poll conducted by Apple Daily on the support ratings of candidates in the Taipei City mayoral election, Ko Wen-je (柯文哲), a pro-Green camp independent, leads the KMT's Sean Lien (連勝文), son of former Vice President Lien Chan (連戰), by approximately 11 percentage points (47.35% vs. 36.73%), while Sean Lien leads DPP legislator Pasuya Yao (姚文智) by 41.96% to 39.27%. Yao won the DPP's first-stage primary for the Taipei mayoral election in a public opinion poll on May 14. UPDATED: A reader observes that the polls are probably matched for ethnicity to the national ratio of about 15% mainlander, rather than the 30% that Taipei hosts. That may account for the discrepancy. Another reader pointed out that lowball polls in Blue papers are a way of motivating KMT voters. However, Apple Daily had generally the same numbers. Vans pouring out of Mugumuyu. UPDATE: Don't miss the comments below. Prior to blocking the road, the residents performed a ritual at a monument erected in remembrance of 39 villagers who were buried by mudslides triggered by Typhoon Ofelia in 1990 by firing gunshots into the air and sending up smoke signals, declaring to their ancestral spirits their determination to defend their traditional territory. “It’s not that we do not welcome visitors, but since our village has been opened to outside visitors in 2006, there have been on average more than 100 minibuses bringing in about 3,000 visitors per day on holidays,” village council chairman Masaw said. “The large number of vehicles has polluted the air, creates traffic jams on the roads and makes it difficult for us to go to work in the fields,” he added. Rakaw Didi, a spokesman for the village, which is administratively known as Tongmen Village (銅門), said that to maintain the village’s ecology and quality of life, the village council passed resolutions at the end of last month to close off the village for a year and to ask future visitors to enter into the village on foot, not in cars. Now the local news is reporting that the police plan to prosecute the aborigines. Of course. A small night market in Taipei. The Changhua District Prosecutors’ Office on Friday indicted a 37-year-old US man for violating the Narcotics Hazard Prevention Act (毒品危害防制條例) by growing nearly 300 marijuana plants in a house in Changhua County’s Yuanlin Township (員林). Please don't be stupid: the judicial system is decades behind here and marijuana is still classified with dangerous hard drugs as a dangerous drug and dealers, even low level dealers, are punished accordingly. Foreigners who come here and sell drugs usually do not operate with police or gang protection. They are freelancers often working established territories belonging to someone else. Moreover, the police love to bust foreigners -- it enables them to feed all the local foreign tropes --- and locals are happy to sell out foreign dealers to get brownie points with the police. Although I have not heard of many busts, they typically have this same pattern -- the police get a tip-off and only the foreigner gets punished, his local friends, middlemen, and dealers aren't bothered. Don't sell drugs here, it just ain't worth it. More promo stuff from gov't on biking in Taiwan. Yawn. Heavy rain expected later this week. Brace accordingly. David Brown on the "anti-Chinese" riots in Vietnam as labor strife. I am in love with Angelina Jolie even more now. Malaysia paper: Why Taiwanese investors shun Malaysia. China links spur Taichung growth at 9% yearly. This year's El Nino, if it comes, could devastate corals throughout the world. Two men rough up a student activist calling for suspension of the Taoyuan Aerotropolis project and public hearings on the project. Note end of video when kid is flung against the wall and then dragged by his hair. Are these men university staff? CSIS Pacnet #42 from Joseph Bosco on Tiananmen and how China should look to Taiwan. J Michael at Thinking Taiwan: Why Taiwan should pay attention to Tiananmen. Michael Cannings with great review of The Languages of Taiwan while Taiwan Explorer comments on the Tongyong vs Hanyu Pinyin argument. CSIS with survey of power and order in Asia. Oz on the MRT management's decision to sue the metro killer for the cost of the stabbing incident. NOT TAIWAN: Strava's global heat map of running and biking. UPDATE 2: J Michael Cole at Thinking Taiwan discusses the affair and provides much detail on MOFA's clarification of who said what. Washington insiders point out that there is no request for radars. Absurd. The [Cong. J Randy] Forbes proposal calls for the Pentagon’s Missile Defense Agency to explore the costs and benefits of merging a Taiwanese early-warning radar, which has the ability to peer deep into China, with the U.S. military’s own missile defense and sensor systems. Mr. Jieh said two to four “long-range early-warning radars” have been built along Taiwan’s western coastline, but some in Taiwan are resisting the idea of expanding the system. “President Ma has been enduring so much domestic pressure, questioning, ‘Why do you need these long-range radar towers detecting the long-range missiles of mainland China that won’t target Taiwan but target some other countries?’” he said. I can't emphasize this enough: no one but some fringe Chinese nationalists within the KMT is resisting these radars, and they do that because they imagine themselves to be Chinese and identify with China. The DPP is solidly behind the radar purchase and deployment and supports increase military purchases and contacts with the US. In my years of riding and talking all over Taiwan I have never heard a single peep against these radars. There is literally no domestic opposition. Again, all the opposition comes from the right-wing freak fringe of the KMT, which opposes anything that might interfere with China's ability to dominate the area. Two conclusions may be drawn here. First, this misrepresentation shows how weird the dialogue within the KMT about policy truly is: it is so weird and out of touch that fringe groups become "many voices" and insanity is treated as so normal that it can be taken out and displayed before the US as if Ma is making sacrifices in supporting the radar: "See how much the President is suffering?" Except the friction is from his own party, because for Ma, those are the only voices that really count. It also shows something else, something deep and visceral about the KMT: its abiding contempt for both Japan and the US. Missiles flying over Taiwan aimed elsewhere can only be aimed at Japanese and US military. Clearly many within the KMT, the party that so many in the US support, are happy to have US and Japanese boys killed by Chinese missiles. Because it doesn't concern them... and makes them feel strong and powerful, because they identify with China, not the west, and not Taiwan. The US needs to rethink its support of the KMT and the Ma Administration. Note again: these facilities and other US defense policies have the solid support of the DPP. The US is backing the wrong.... Horse. UPDATE: Taipei Times has latest. Privately I've heard that Jieh says Washington Times put the words of others in his mouth.